World 8-5 is the fifth level of World 8 in Super Mario 3D Land. The level is modeled after a fortress. The player starts out on a set of platforms, then must cross two rock-style Donut Lifts to reach a Red-Blue Panel. They must cross three more of these, while avoiding Paragoombas. 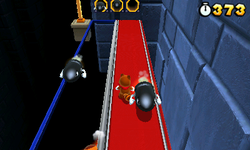 The player must then cross some more rock Donut Lifts downward to reach more platforms and more Reversible Platforms; on the other end of the reversing platforms are three Bill Blasters, and a pole that Mario must climb to reach an elevator that takes him to the next area; the Checkpoint Flag is here. Afterward are several Reversible Platforms, as well as Rocky Wrenches. After this, the player must clime more rock Donut Lifts to get to another platform with several more Reversible Platforms after. The obstacle for these platforms are Banzai Bills; however, they only fire toward the red sides of the platforms. After this is another set of two Reversible Platforms with another Rocky Wrench on the other side, followed by the Goal Pole. Star Medal 1: The first Star Medal is found at the beginning of the level, on the blue side of the fourth Reversible Platform. Star Medal 2: After the Checkpoint Flag, the player sees the second Star Medal above a Rocky Wrench. Star Medal 3: After the second Star Medal, the player should come across a Mystery Box. Hopping into it transports the player to a room with three Rocky Wrenches plus the final Star Medal.